Palestinian unity government ministers in Gaza Strip have met with members of Miles of Smiles aid convoy at the cabinet headquarters, where they stressed the importance of the efforts made to break the siege on Gaza. In a press conference held on Monday following the meeting, Justice Minister Salim al-Sakka expressed hope that this visit would be the last that come under Israeli siege on Gaza. Al-Sakka appreciated the convoy members' efforts and sacrifices, noting that it is the first visit they make after the formation of the unity government. He vowed that the Israeli siege on Gaza will come to an end soon. Housing Minister Mufid al-Husayna, in his turn, expressed his appreciation to the efforts made by the convoy delegates during their travel to Gaza. “We look forward for your next visit after lifting the siege on Gaza Strip”, he said. For his part, head of Miles of Smiles convoy Issam Youssef said that the aid convoys will continue until the Israeli siege on Gaza comes to an end. “We have sent hundreds of solidarity delegations to the West Bank via Jordan and to the Gaza Strip via Egypt”, he underlined. More than three thousands solidarity activists have entered the Gaza Strip as part of Miles of Smiles convoys to show their support for the Palestinian people and their just cause, he continued. 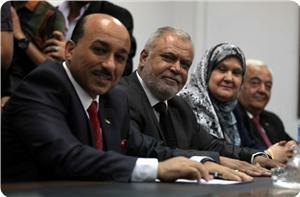 The "Miles of Smiles 28" aid convoy arrived in Gaza Strip on Sunday through Rafah crossing, a Palestinian official said. Alaa al-Din al-Batta, deputy director of the governmental convoy-welcoming committee, told Ma'an that the convoy included 18 people from European and Arab countries. Five Algerian solidarity activists have staged a sit-in at the Egyptian side of the Rafah crossing, after Egyptian authorities prevented their access to Gaza to accompany Algeria-Gaza 2 medical convoy. 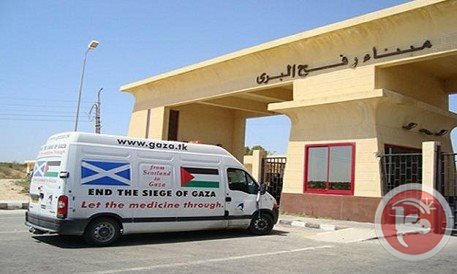 The Egyptian authorities allowed Monday the entry of Algeria-Gaza 2 medical convoy the besieged Strip via Rafah crossing carrying medicines and emergency medical supplies, while preventing the Algerian delegation, consisting of 5 solidarity activists, from having access to Gaza without giving reasons. The Algerian convoy's media coordinator said in a press release on Tuesday that their sit-in will continue on the Egyptian side of the Rafah crossing till they are allowed access into Gaza. He expressed surprise over the Egyptian decision to prevent the delegation's access to Gaza despite completing all necessary security measures. The Egyptian authorities allowed the access of five containers carrying medical supplies, estimated at three million dollars, for the processing of the Algerian hospital in Khan Younis city, which was opened few days ago. Meanwhile, the Israeli Occupation Authorities (IOA) continued to close Kerem Abu Salem crossing southern Gaza Strip for the second day in a row under the pretext of Jewish holidays. The occupation authorities decided last Thursday to close the crossing on Tuesday and Wednesday and to re-open it next Thursday under the pretext of Jewish holidays. Kerem Abu Salem is the only commercial crossing in Gaza, through which goods and fuel supplies are, partially, allowed access. [Sunday, May 18, 2014] Around 30 international peace activists, in two humanitarian convoys, made it into the Gaza Strip through the Rafah Border Terminal, between Gaza and Egypt. The convoys, Miles of Smiles 27 and Algeria Convoy, carried various medical and humanitarian supplies to deliver to various medical centers and instructions in the besieged Gaza Strip. The Ma'an News Agency has reported that members of the dissolved government in Gaza, various legislators, and Hamas political leaders welcomed the humanitarian activists who will later be holding a meeting with Ismael Haniyya of Hamas. Miles of Smiles 27 carried ten solidarity activists, while the Algerian convoy carried 20 persons. The supplies include medical equipment and urgently needed medical supplies and medications. The two convoys intend to stay in Gaza for a few days to visit various governmental and civil instructions, and will be participating in an official ceremony, announcing the opening of the Algerian Specialized Hospital in Gaza. Last month, Miles of Smiles 26, carrying humanitarian and medical supplies and various Arab and international Activists, made it into the Gaza Strip. Israel's illegitimate siege, an act of collective punishment to the entire population of Gaza, left Gaza's hospital and medical settlers lacking basic supplies, medications and equipment. At least 324 Palestinians have also been killed in tunnel collapse incidents across the border with Egypt since Israel imposed the deadly siege on Gaza in 2006. At least 20 Palestinians were killed when the Israeli military bombarded tunnels while they were in them. Princess Haya Bint Al Hussein, wife of Sheikh Mohammed Bin Rashid Al Maktoum, Vice-President and Prime Minister of the United Arab Emirates (UAE) and Ruler of Dubai, has made a generous donation for food aid to refugees in the Gaza Strip, UNRWA said Thursday in a press release. The donation ($553,800 US) comes in response to the UNRWA's Emergency Appeal for the West Bank and Gaza, Palestinian News & Info Agency WAFA has reported. These funds will enable UNRWA to provide 5,300 individuals from 976 families, in the Khuza'a municipality of Khan Younis, with food assistance for 12 months. "In 2014, no mother should worry where the next meal will come from for her children. But politics has trapped too many Gazans in a world of poverty and hunger they cannot escape," said Princess Haya, underlining: "We all need to do more to end this pointless suffering." In Gaza, 56 per cent of refugee households are food insecure, WAFA further reports, while another 14 per cent are vulnerable to food insecurity. UNRWA wishes to help some 790,000 refugees meet their basic requirements through direct distribution of emergency food assistance. Some 1.2 million, total, of approximately 1.7 million inhabitants of the Gaza Strip are Palestinian refugees registered with UNRWA. A humanitarian aid convoy is scheduled to arrive in the besieged Gaza Strip Sunday via Egypt’s Rafah crossing, coordinator Issam Yousuf said Thursday. More than 20 solidarity activists from Jordan will accompany the convoy known as “Miles of Smiles 27/Ansar 5.” The convoy adopted a slogan of national unity as its arrival coincides with a unity agreement signed between Hamas and Fatah. 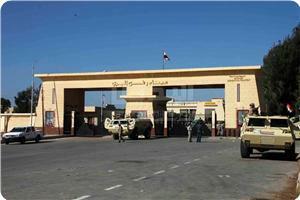 An aid convoy from Algeria was denied entry to the Gaza Strip via the Rafah crossing on Tuesday, the convoy's coordinator told Ma'an. Muhammad Abu Mirie said that the convoy was stopped by Egyptian authorities, who said the convoy's entry had been postponed to Sunday. 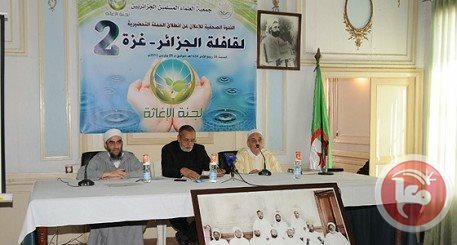 If allowed to enter the Strip, the convoy will deliver medicine and medical equipment to the Algerian hospital in Khan Yunis, Abu Mirie said. Rafah has been the principal connection between Gaza's 1.7 million residents and the outside world since the imposition of an economic blockade by Israel in 2007. There have been frequent closures of the crossing in recent months due to political unrest in Egypt and violence in the Sinai peninsula, placing an added burden on Gaza Strip residents. After the July overthrow of president Mohamed Morsi, Egypt's army has repeatedly closed the Rafah border crossing and destroyed hundreds of tunnels that Gazans used for years to import fuel, building materials, and other goods. 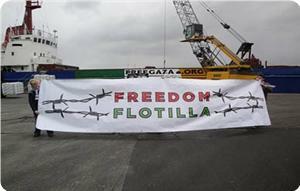 Freedom Flotilla Update: "We Will Sail in the Fall!" Following is a statement by the Freedom Flotilla Coalition regarding the April 29th attack on Gaza's Ark. Statement from the Freedom Flotilla Coalition regarding the attack on Gaza's Ark, for immediate release. The attack, which occurred on April 29th, caused substantial damage to the hull of the boat. These hull damages and others caused by the explosion need a minimum of 2 months work to repair at a cost of approximately US $30,000. The authorities have not yet concluded their investigations of the incident, so it is premature to blame anyone, but it is well known who enforces the blockade on Gaza and who doesn't want it challenged. Preliminary results of the investigation and inspection by our partners indicate that the materials which were used in the attack are not readily found in Gaza. Freedom Flotilla boats have been sabotaged before in the ports of Cyprus, Greece and Turkey, over the last 5 years, as they were preparing to sail to Gaza to challenge the blockade. Boats that sailed to Gaza have been attacked by the Israeli Navy in international water, in one case lethally, and in others with force which caused a boat to sink. Boats that were not sabotaged (over half a dozen) were hijacked and towed to Ashdod. This attack on Gaza's Ark took place as Israel is under increased legal pressure for its deadly attack on the first Freedom Flotilla in 2010 at the International Criminal Court (ICC) and in Turkish courts. It also happens as Israel is increasing pressure against all Palestinians in retaliation against efforts at national reconciliation between the West Bank and Gaza. 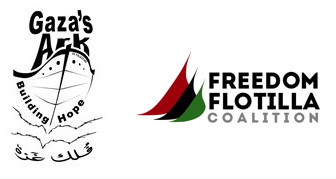 The Freedom Flotilla Coalition commits to continue its work against the blockade of Gaza in all ways and by all non-violent means possible, including supporting the May 31st International Freedom Day for Gaza. The alliance of Freedom Flotilla intends to hold a meeting on 10-11 May in London to discuss the mechanism to break the maritime blockade on the Gaza Strip. Representatives of member groups from about 10 countries are expected to attend the meeting. The alliance will also hold a news conference next Monday to announce the steps to be taken to break Gaza siege. Member of the alliance Zaher Berawi said in a press release that the meeting would discuss the efforts being made to encounter the blockade and the latest developments regarding the boat project "Gaza Orbit," which is slated to sail from Gaza to the outside world soon. An improvised cargo ship built by fishermen and international activists was hit by an explosion in Gaza early Tuesday, the Gaza's Ark initiative said in a statement. No injuries were reported, but the boat was extensively damaged, the statement said. The perpetrators of the attack remain unclear. 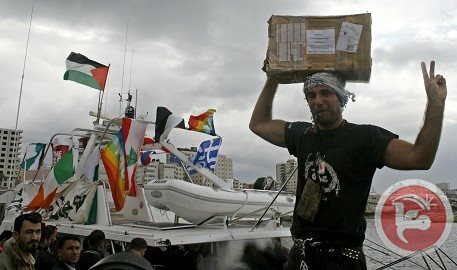 The boat, dubbed Gaza's Ark, was set to bring Palestinian products from Gaza to Europe in protest against Israel's economic blockade on the coastal enclave. "Gaza's Ark and all our partners in the Freedom Flotilla Coalition are considering our next move in response to this cowardly act of terrorism," David Heap of Gaza's Ark Steering Committee said in the statement. "But our position remains clear: Neither this nor any other attack will stop our efforts to challenge the blockade of Gaza until it ends." "This attack comes as we were almost ready to sail," said Ehab Lotayef, another member of the Steering Committee. "You can sink a boat but you can't sink a movement." If Gaza's Ark set sail to Europe, it would mark the first time goods from Gaza have been exported by sea since the signing of the 1994 Oslo Accords. 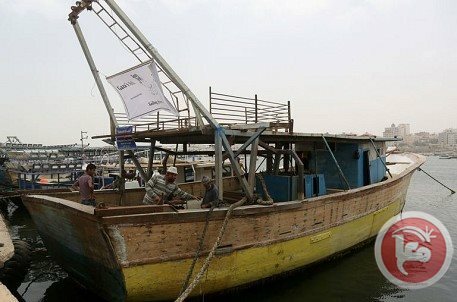 Under the terms of the current restrictions, Gaza fishermen are not allowed to enter waters more than three nautical miles from the shore, with naval patrol boats firing at those who enter "unauthorized fishing areas." 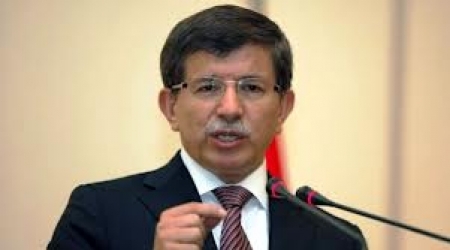 Ahmet Davutoğlu Minister of Foreign Affairs of Turkey said that his country would provide humanitarian aids to the West Bank and the Gaza Strip to facilitate the implementation of the Palestinian reconciliation agreement which signed Wednesday. Oğlu emphasized, during a telephone call with the Palestinian Prime Minister in the Gaza Strip Ismail Haniyeh on Thursday, the Turkey's full support for national reconciliation between the two rivals Hamas and Fatah. He promised to launch diplomatic contacts with the foreign ministers of several states including Washington to support the reconciliation. Oğlu invited Haniyeh to visit Turkey and considered the completion of the reconciliation agreement an important step that Palestinians presented to serve their cause. He pointed out that the Turkish Foreign Ministry celebration of Palestinian children in the Turkish child day is an affirmation of their permanent standing next to the Palestinian issue.